[First published July 8, 2005] There are two myths about terrorism that have gripped commentator’s’ minds and won’t let go. One is that poverty is an engine of terrorism and the other is that Madrassas provide the fuel. This article provides an empirical investigation of the determinants of terrorism at the country level. In contrast with the previous literature on this subject, which focuses on transnational terrorism only, I use a new measure of terrorism that encompasses both domestic and transnational terrorism. In line with the results of some recent studies, this article shows that terrorist risk is not significantly higher for poorer countries, once the effects of other country-specific characteristics such as the level of political freedom are taken into account. 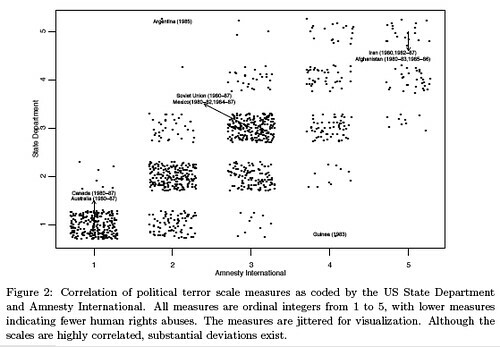 Political freedom is shown to explain terrorism, but it does so in a non-monotonic way: countries in some intermediate range of political freedom are shown to be more prone to terrorism than countries with high levels of political freedom or countries with highly authoritarian regimes. This result suggests that, as experienced recently in Iraq and previously in Spain and Russia, transitions from an authoritarian regime to a democracy may be accompanied by temporary increases in terrorism. Finally, the results suggest that geographic factors are important to sustain terrorist activities. Op-Ed article by Peter Bergen and Swati Pandey disputes notion that Muslim religious schools, known as madrassas, are graduating students who become terrorists; says madrassas may breed fundamentalists, but they do not teach technical or linguistic skills necessary to be effective terrorist; says that as matter of national security, United States need not worry about Muslim fundamentalists with whom it disagrees; cites examination of educational backgrounds of 75 terrorists behind some of most significant recent terrorist attacks against Westerners, finding that only 9 of them attended madrassas; says World Bank-financed study raises further doubts about influence of madrassas in Pakistan, country where schools were thought to be most influential and virulently anti-American. It’s true that the madrassas do not generally produce people like the educated terrorists who attacked us on 9/11. However, the madrassas *do* produce many of the the foot soldiers for Al Qaeda (and its affiliates) who are fighting us now in Iraq and Afghanistan, and who have fought in the Balkans, Chechnya, pre-9/11 Afghanistan, and elsewhere. An Algerian militant considered the mastermind of the 2003 kidnapping of 32 European tourists in the Sahara desert was sentenced to life in prison for helping to form a terrorist group, but his whereabouts remained a mystery. This is an amusing example of how the LA Times refuses to call terrorists terrorists, even when their own report has to so identify a terrorist. I fell out of my seat with laughter when I read the headline. Series. Click cover for synopsis and free download. [First published February 10, 2005] Why, it is asked, should we be so afraid of terrorists having nuclear weapons when during most of the Cold War the Soviets had enough nuclear weapons to utterly destroy every major American city, and then some? Surely, the terrorist could not develop such a vast number of nukes. Yes, may be one or two, maybe in the long run even three of four, and certainly they will be a threat, but nothing like the Soviets were, it seems. And since we handled the Soviets, we should be able to deal with terrorist’s nukes. Right? Wrong. What protected us from a Soviet first strike with their nuclear weapons was the American defense policy of deterrence. That is, if the Soviet’s attacked us, we would massively retaliate with our own nuclear weapons. In the early years of the Cold War, this meant attacking Soviet cities and major military targets. In the waning years of the Cold War, this policy was redefined to mean targets of value to the Soviet rulers, which were not only the most important military targets, but also the Communist Party, the rulers themselves, and their means of control over the nation. Now, if the terrorists get nukes, how do we deter them? They operate in diffuse gangs, often with the secret help of sympathetic nations or groups within nations (such as a Muslim sub-community). And they are willing to die for their cause, which is often simply killing Americans. If the terrorists are able to hide a small nuclear bomb in a container unloaded in New York, and set it off, the result would be a city destroyed and perhaps half-a million murdered. Now, whom do we retaliate against? Of course, we will try to track the source of the nuclear bomb, and perhaps find that it was constructed with the secret help of rogue scientists from Russia and Pakistan, with ingredients and parts from N. Korea, France, and China, much of it commercial. You can be sure that if such a bomb is exploded in the U.S., there will not be a clear relationship between the terrorists and any nations, as there was between El Quida and the Taliban of Afghanistan. In other words, an anti-terrorist-use-of-nukes policy of deterrence will not work. For this reason alone, their getting nukes are more dangerous than when the Soviets had them. This understood, then what is to be done? What we are doing now. Imprison or kill the terrorists, destroy their infrastructure, warn states that are supporting them about the consequences and apply pressure and sanctions, and prevent supporting states such as Iran from getting nukes themselves. And work at the underlying cause by working to democratize possibly supportive tyrannies. Democracies will never be a danger to us, or support terrorism. Above all, treat global terrorism as the war it is. There is too much at stake not to. Oh, yes, let “nukes” stand for all weapons of mass destruction, and not a word of the above need be changed. SEOUL, South Korea (AP) – North Korea on Thursday announced for the first time that it has nuclear arms and rejected moves to restart disarmament talks anytime soon, saying it needs the weapons as protection against an increasingly hostile United States. N. Korea was helping Libya develop nuclear weapons, and is reportedly helping Iran. How long before Kim Il-jong decides the way to hit at its greatest enemy, the United States, is by helping the terrorists go nuclear. As for N. Korea itself, too much is made of its lack of reliable and long-range nuclear tipped missiles. Come now, there are many ways to deliver nuclear weapons without a missile (beside which the source of a missile is easy to track). How about exploding one hidden in a freighter off the port of New York? 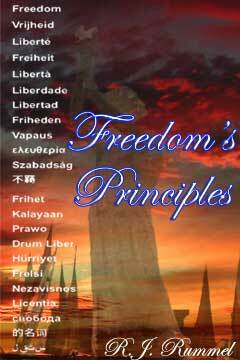 [First published March 15, 2006] So far, there is considerable empirical support for the argument that promoting global freedom, if successful, will make the world generally more peaceful, and possibly end war and democide. However, there has been little empirical work that bears specifically on terrorism in the context of the democratic peace. So, I will do that here. 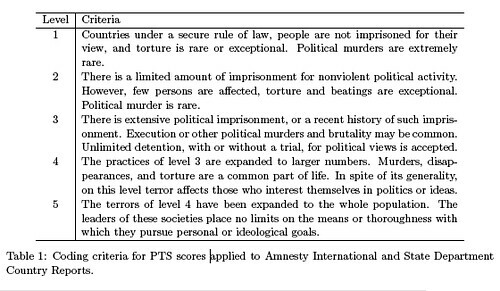 A relevant scale for doing this is the Purdue Political Terror Scale (PTS) shown below. It attempts to measure the degree to which governments terrorize their citizens and deprive them of human rights. Mark Gibney and Mathew Dalton developed the Political Terror Scale. An article on it, plus “Political Terror Scale Notes” and the actual scoring on it each year for all nations, 1980-2004 is available on Gibney’s personal website . He is Belk Distinguished Professor and Professor of Political Science at the University of North Carolina Ashville. I know, I know, this is not the terrorism that is focused on today, which is that of small groups of terrorists, their murder and genocide bombing, and their insurrections. But, behind it all are level 4 or 5 PTS states, such as Iran, Syria, and North Korea, as were Fatah’s Palestine Authority, Saddam’s Iraq, and the Taliban’s Afghanistan. Democratize these states and individual and group terrorism will dry up for want of resources and bases, at least as implied by the Forward Strategy of Freedom. But, we’ll see. As to the two politically antagonistic sources — State and AI — the above CME report finds that the correlation between them across all the countries in their report is .83, which means that in their reporting of human rights these two sources are at variance across 31 percent of the data (1-correlation squared). Now, my empirical question is this: How well does the degree of liberal democracy of a nation predict its scale level on the PTS, which is to say, terrorism and lack of human rights. I took the PTS values for 2004 and the Freedom House freedom ratings for the same year on both civil liberties and political rights, where the lower the average rating on both, the more liberal democratic a nation. Then, I did a bivariate regression, and found that the degree of freedom predicted 32% of the variation in terror/human rights (R squared = .32, a very conservative finding, given the CME conclusion about democracy and human rights given above). That is, the more liberal democratic a nation, the less its government terror and the more its government respects human rights [PTS = 1.51-27(Freedom rating); signs on both scales reversed]. Since the relationship may not be linear, I should note that the analysis of variance is very good (F-stat = 81.6, p <.0001) In my next post, I’m going to explain what this sometimes mysterious “p” that appears in so many quantitative studies means, and its pitfalls. Just take my word today that “p” here is not a sampling probability (it cannot be since I am dealing with all countries and not a sample in any meaningful statistical sense), but a combinatorial one. 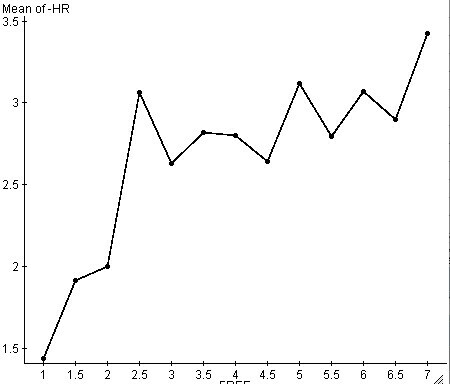 Anyway, my plot of the two is shown below, where -HR is the reversed PTS, and the X-axis is the reversed freedom ratings. For -HR, 1 is the most terroristic nations with the least human rights, and 5 reverses this; for the -FREE average ratings, 1 is the least free, 7 the most. Thus, as one moves to the right on the X-axis and up on HR (PTS) Y-axis, the greater the freedom, and the less the terror and the more respect for human rights. Obviously, there is considerable variation around a trend of decreasing terror/increasing human rights as freedom increases. 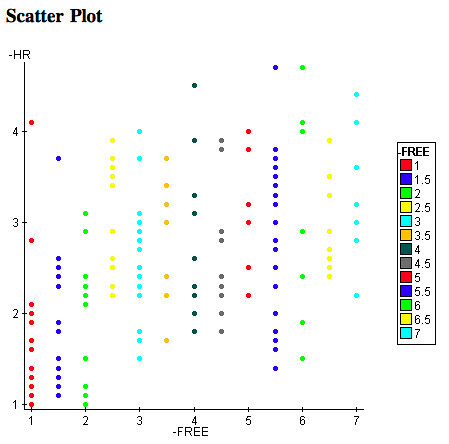 To see this, I averaged the PTS scores for each freedom rating. I show the result in the plot below, where the axes are the same as above (sorry, the X-axis label is cut off). The bottom line should be clear. To eliminate the terrorism of governments against their people and guarantee their human rights, foster democratic freedom.And this is now the American foreign policy, which judging by all the empirical analyses that support it, is one of realistic idealism. Professor Fukuyama currently Bernard L. Schwartz Professor of International_Political_Economy and Director of the International Development Program at the Johns_Hopkins_University”Johns Hopkins University School of Advanced International Studies. He is best known for his, The End of History and the Last Man. Professor Garfinkle is editor of the American Interest, and has taught U.S. foreign policy and Middle East politics at the University of Pennsylvania, Haverford College, and Tel Aviv University. The Wall Street Journal recently asked: “Anyone out there have a better idea” than the Bush administration’s policy of high-profile democracy promotion in the Arab and Muslim worlds as a means to fight terrorism? Well, yes, there is one. That better idea consists of separating the struggle against radical Islamism from promoting democracy in the Middle East, focusing on the first struggle, and dramatically changing our tone and tactics on the democracy promotion front, at least for now. RJR: Promoting democracy and fighting terrorism are one in the same. Democracies do not as a matter of policy promote or sponsor terrorism, understood as murdering unarmed and innocent men, women, and children to promote a political or religious cause. The essential problem with the administration’s approach is that it conflates two issues that are separate. The first has to do with violent, antimodern radical Islamism (on display both in the reaction to the Danish cartoons and in the mosque bombing in Samarra); the second concerns the dysfunctionality of political and social institutions in much of the Arab world. RJR: The answer to both is still democracy, as many Arab liberals, to their personal endangerment, have been trying to point out. On this, see Barry Rubin’s, The Long War for Freedom: The Arab Struggle for Democracy in the Middle East. It is, of course, the administration’s thesis that the latter condition causes the former. It is also its contention that U.S. Cold War policies of support for Arab “friendly tyrants” are mainly to blame for Arab authoritarianism. Thus did the president say in November 2003–since repeated several times by Condoleezza Rice–that we sacrificed freedom for stability in the Middle East for 60 years, and got neither. RJR: I agree with Bush and Rice on this. It follows from this view that if the United States stops supporting authoritarian regimes and instead does all it prudently can to bring about democratic ones, our terrorist problem will be dramatically reduced if not altogether solved. RJR: Yes, I think terrorism would be sharply reduced, but not necessarily solved, although that is possible also. Authoritarian political cultures do function as enablers of radical Islamism, but the essential cause of the latter–today as before, in dozens of historical cases concerning violent millenarian movements–is the difficulty that some societies and individuals have in coming to terms with social change. That is why rapid modernization is likely to produce more short-term radicalism, not less. Muslims in democratic Europe are as much a part of this problem as those in the Middle East. This is not a trivial point; it is a central one that directly challenges a key tenet of the administration’s view. What the administration sees as one problem ought to be seen as two. Radical Islamism needs to be dealt with separately from democracy promotion. This involves doing everything we can to ensure the political success of the governments in Afghanistan and Iraq. It also involves killing, capturing or otherwise neutralizing hard-core terrorists in many parts of the world, and keeping dangerous materials out of their hands, in what will look less like a war than like police and intelligence operations. RJR: Modernization and democracy are not the same thing, but democracy is the best system for handling the stresses and strains of modernization. As to the point about Europe, the terrorism by emigrant or Muslim citizens is directed at their democratic governments, while terrorism is not supported nor knowingly encouraged by these governments. Create such democracies in Arab lands, and in time, terrorism against such governments will wither away for lack of foreign and domestic support. Stretch one’s mind on this. Imagine that Iran, and all Arab states, are democratic. From whence, then, would the radical Islamist and terrorists come? From dissatisfied domestic Muslims? But democracies have always had dissatisfied radical non-Muslim terrorist groups of some kind, even terrorists, as for example, the radical leftists during the Cold War and bomb throwing anarchists before WWI. But, democracy has been robust enough to handle them until they disappear for want of governmental and popular support. But the threat above all lies on the level of ideas. Just as it proved possible to stigmatize and eventually eliminate slavery from mainstream global norms without having first to wait for the mass advent of liberal democracy, it should be possible to effectively stigmatize jihadi terrorism without having first to midwife democracies from Morocco to Bangladesh. The United States and its Western allies should be helping genuine, traditional and pious Muslims to reassert their dominance over a beautiful and capacious religious civilization in the face of a well-financed assault by extremist thugs. RJR: Beautiful and capacious religious civilization? This is multiculturalism rearing its blind and wooly head. Nothing beautiful about a civilization that largely supports the outright murder of people en masse because they are non-Muslims, or secular Muslims. This is an aspect of Islam, as currently practiced in Arab nations. Anyway, this seems to ignore that the authoritarian Arab dictatorships use the Islamists to fight foreign pressure for liberalization, and to continue to repress their people. ….To put it mildly, the Iraq war has not increased the prestige of the U.S. and American ideas like liberal democracy in the Middle East. RJR: Of course, the thug regimes, and those that through corruption and rich appointments hugely benefit from them, do not like the war, nor do the Islamists and terrorists. Nonetheless, the process of democratization of the Iraqi people has generated considerable questioning of the status quo by the people, and a movement toward democracy that had not existed before. ….The Bush administration has indeed opened up new space for debate and political participation in the Arab and Muslim worlds. But recent elections in Iran, Egypt, Palestine, and Iraq have either brought to power or increased the prestige of profoundly illiberal groups like Hamas and the Egyptian Muslim Brotherhood; even our putative friends in the Shiite alliance that did well in last December’s Iraqi elections have been busy institutionalizing an intolerant Islamist order in the parts of Iraq they control. Administration principals speak of creating public space for dissent and debate lest it all be driven into the mosque, with the risk that this “might” bring illiberal groups into power. The tide of public opinion today is not running in favor of pro-Western secular liberals, however, but rather the Islamists. In many Arab countries this means that premature democratic elections will most definitely and predictably bring the mosque into the public square while driving out all other forms of expression. The tolerant are making democratic way for the intolerant, who in turn are very likely to block the possibility of any reverse flow of authority. How such dynamics promote liberal democracy in the longer run is hard to see. More likely, U.S. policies that foster pro-Islamist outcomes will delay political liberalization, help the wrong parties in the great debates ongoing in Muslim societies and, quite possibly therefore, make our terrorist problem worse. RJR: I’m surprised that Fukuyama buys into this. Where before in the Middle East there were bloody thug regimes, mass murder, the persecution of liberals, and no freedom of speech, there have now been elections in a number of Arab countries, the establishment of parliaments, and some democratization. This is a long process that may involve two-steps forward a one-step back, as it did in the growth of democracy in the United State, Britain, and France. We need to change tactics in the way we go about supporting Middle Eastern democracy. The administration’s highly visible embrace of democracy promotion as a component of its national security strategy (as outlined in last week’s official document on the subject), and its telegraphing ahead of time of intentions to bring about regime change in places like Iran, only hurt the cause of real democrats in the region. The effort to push countries toward early national elections, given the rising Islamist tide today, will invariably force us into the appearance of further hypocrisy when they produce results we don’t like. RJR: There is nothing in democratic theory that says we should like the outcome of democratic elections. If the results are another Hamas win, so be it. The people have spoken, and that is what democracy elections are about. Islamist parties in Egypt and Palestine have gained popularity in large measure not because of their foreign policy views, but because of their stress on domestic social welfare issues like education, health, and jobs, and their stand against corruption. Fine, let them deliver; and if they don’t or turn out to be corrupt themselves, they will face vulnerabilities of their own not far down the road. RJR: This is my argument as well, but what Fukuyama and Garfinkle seem not to see is the inconsistency of this with much of what they write previously. Democracy promotion should remain an integral part of American foreign policy, but it should not be seen as a principal means of fighting terrorism. We should stigmatize and fight radical Islamism as if the social and political dysfunction of the Arab world did not exist, and we should shrewdly, quietly, patiently and with as many allies as possible promote the amelioration of that dysfunction as if the terrorist problem did not exist. It is when we mix these two issues together that we muddle our understanding of both, with the result that we neither defeat terrorism nor promote democracy but rather the reverse. The terrorists utter long run dependence on the support of these thug regimes. The power of democratic freedom to end war, internal violence, and democide. The effect of the ongoing democratization of Iraq and Bush’s Forward Strategy of Freedom on thug regimes in the Middle East, and particularly in helping liberal Arabs fight for freedom. [First published April 3, 2004] I will put aside the horror I feel over the Islamicists (Islamic fundamentalists, Islamo-fascists) democide and genocide bombing (so-called suicide bombing). I will assume that all who visit this blog hate as I do the mass murder of thousands of human beings by these international gangs of murderous thugs, often supported by one Islamic dictatorship or another. At this moment, I want to post this commentary to those who teach the young, as I did for over thirty years. The problem of teaching such democide is to communicate understanding of why the murderers do so, as we have seen the major media attempt to do. To the open-minded intellectual and teacher, to the rational minded, this seems what we should be about. As so many have said, understanding is not only the first step of wisdom, but it is the necessary condition of the eventual control and elimination of such violence. But herein is the trap. Hypothesize that one is a teacher on September 4, 1939, three days after the invasion of Poland by Germany and the outbreak of WWII. As one would know then, this invasion tripped the British-French declaration of war. This was the outbreak of a European war, and it was discussed everywhere, with photos in the newspapers of dead and dying soldiers, tanks, cannon’s barking, and all that. One’s students, of course, want to know what is going on. Why the invasion? Why the war? As a teacher, one now has an obligation to explain. To do so, let us say that one tries to get one’s students to understand why Hitler invaded Poland. One therefore goes into the Versailles Treaty, and its heavy reparations on Germany, the unfairly perceived blame that Germany had to suffer, the loss of German dignity and honor, and then the Polish attacks across the border (German propaganda widely believed at the time). And of course, there was the “hypocrisy” of the Allies, what with Britain’s military actions and democide in South Africa and India, and France’s rapacious imperial rule and democide in Indochina, Algeria, and elsewhere in Africa. After this lecture, what is the student left with? One might feel that now one has communicated understanding, and fulfilled one’s teaching role. And what are the consequences? Out of the best of intentions and commitment to understanding, one has unconsciously provided aid and sympathy for Hitler. One has argued, in effect, Hitler’s side, and thus given aid and comfort to the enemy of freedom and a rapacious murderer. Why? Three things are missing in this. One is the character of Hitler, his worldview, and how he runs his country. Two, his intentions–what he after and what would the world be like if he won this war. And three, as important, not only their sins, but also the virtues of his enemies should be highlighted. Only all this together, I submit, would provide a solid basis for students’ evaluating what is going on. Now, with regard to the Islamic terrorists, the same holds. I have seen much in the major media, sometimes written by professors, and which can only reflect what they teach, attempts to understand why the terrorists have committed such murders as 9/11, and recently the Madrid bombings. But note what is missing. 1. In international and virtually all civil laws, it is the greatest evil to murder innocent people en masse. Conscientious governments, diplomats, anti-war organizations, academics, and others have worked for centuries to limit and restrain attacks on civilians, with much success until the Islamicist terrorism. We have the history of the various Hague Conventions, the Geneva Conventions, the Genocide Convention, and now the International Court of Justice. Yet, these murderous attacks go on without much reference in the media to this barbarous regression to the extermination of men, woman, and children during the times of the Ancient Greeks and Romans, Genghis Khan, and the European Middle Ages. Or, look at these murders another way. The terrorist attacks are comparable to serial murder within a state by a citizen, but here done on foreigners. In this case, the attacks are the greatest serial murders ever committed in written history by civilians (not governments, or their agents). Surely, an understanding of this butchery requires this context. 2. These serial murderers belong to a fanatical belief system that is even more totalitarian and absolute than that practiced by communist countries. Were these Islamicists in power, there would be no human rights, no freedom of speech whatsoever, no freedom of religion at all. Even those of different sects within the Muslim faith would be killed. Any dissidents would be murdered, as would any one with different political beliefs, or who even inadvertently criticized Mohammed. All women would be, in effect, enslaved. And even buy and sell slavery could be condoned or practiced, as in one of their supporting regimes, Sudan. In sum, these people would, if they had the power, create an absolutist, slave society. 3. As to the sins of the United States, yes, there has been many, but also there have been greater compensating virtues that also should be mentioned to students (you can’t assume they know these, anymore than they know the value of their right arm until it is cut off). Americans fought a war to end slavery, the greatest war fought between the Napoleonic Wars and World War I. Compared to other countries, the rise in power, wealth, and influence of minorities and women within a comparatively short time has been incredible. Compare the hatred and discrimination the Irish, Italians, Asians, and others suffered their first decades in America to now. America has been one of the most commiserating and helpful nations in times of human disaster, giving of itself tremendous aid and support to other countries, regardless of enemy or friend. During the communist Civil War in Russia, American food aid saved several million lives. Then closer to our time, consider the aid to Somalia, which may have saved a million alone. Then consider that in 1945 the United States emerged as not only the most powerful nation, but also in full control of its former enemies, Japan, Germany, and Italy. Yet, did it exploit them to create a Roman like empire? No, it gave them all massive aid to recover from the war, and then gave them back their freedom. Now, with the collapse of Soviet Power, there is only one superpower in the world, the United States. But has it used that power to rule the world. Hardly, the easy evidence is how many weak nations and self-professed enemies can thumb their nose at America, as long as they do not endanger its security, as did Afghanistan and Iraq under Hussein. Only, I believe, when we communicate to students and others about contemporary terrorism in this way will they truly understand what is going on.